I’m at the mall with my brand new dad. It’s 1998. I’m 9 years old. We walk into the only place that matters for a late 90’s boy: Electronic Boutique. New dad had saved us from a life of poverty and treated us with love and respect, but right now all that matters is what lines the shelves of EB Games. I flip and scour those crystal CD cases with a level of deliberation and anxiety most people leave for things like deciding if they want to keep the baby. Then I see it. 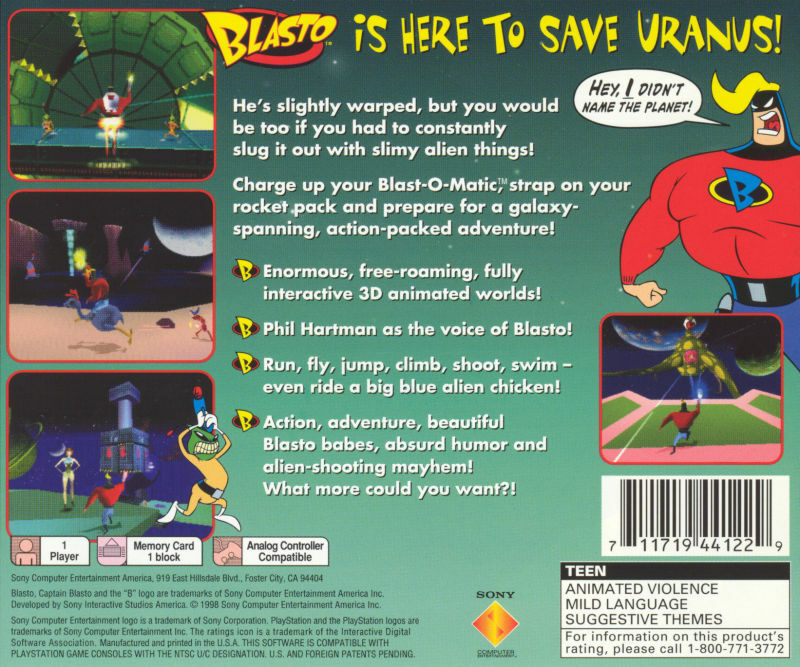 The perfect mix of cover art and back of the box messaging: Blasto. Sure, I’m too young to fully grasp the comedic nuances of Uranus. But the the promise of a Cartoon Network space adventure is for me. It was going to be so much cooler than the Playstation demo I play all the time. Look at that ray gun! And Blasto babes, I’m never going to tell anyone cuz girls are ew, but I’m curious. I hand it to dad 2.0. He chuckles. The EB Games rep asks if we’re interested in getting the thickly bound game guide. I look up at the man with the money. He agrees. Today is the best day of my life. I found out almost two decades later that Blasto was one of the worst reviewed games of 1998. The reviews themselves are interesting oddities—awkward like an adult learning a new language, grasping for a vocabulary to talk about games. But this was a time when game reviews were not an integral part of a game’s lifespan. I went with my gut and the product’s own description of itself. It’s almost sad how the pleasure of gambling—my parent’s money—on an unknown game has been displaced by internet curation. Curious, I googled what else I could have played in 1998. The year is considered one of the best in gaming history. Hyperbole or nah? Lets have a look. Okay. Maybe Objective truth. 1998 solidified some of the longest living game franchises and developers in the game industry. Phil Hartman, the titular voice of the game, died two months after the game’s release. So it goes. Blasto follows the epic space opera of a horny idiot who skipped leg day. Most of the game’s comedy was lost on me. Not that there was much more than Uranus jokes and Blasto’s promiscuity. In fact, the game’s jokes could probably not be made today without being skewered for misogyny and teenage boy shits and giggles like the inclusion of an implied harem. I never got past the 4th or 5th level. This game has such broken and strange design that it makes Dark Souls feel like Hello Kitty Island in comparison. Blasto, himself, controlled like I programmed a block in Unity to move and jump. The auto-aim system must be using Destiny’s RNG to calculate hits. There’s manual aim in the form of a blue rectangle, which was borderline dangerous and useless. All those features are enhanced* with a game that’s rogue-like in the old Super Nintendo way (lose all your lives, start from the beginning). For my prepubescent self this made Blasto unbeatable. Even with the game guide. Yet I sank hours and hours into Blasto, enthralled with it’s immature tone, the promise of power-ups, new ray guns, and a strange world that to 9 year old me felt like worthwhile escapism. 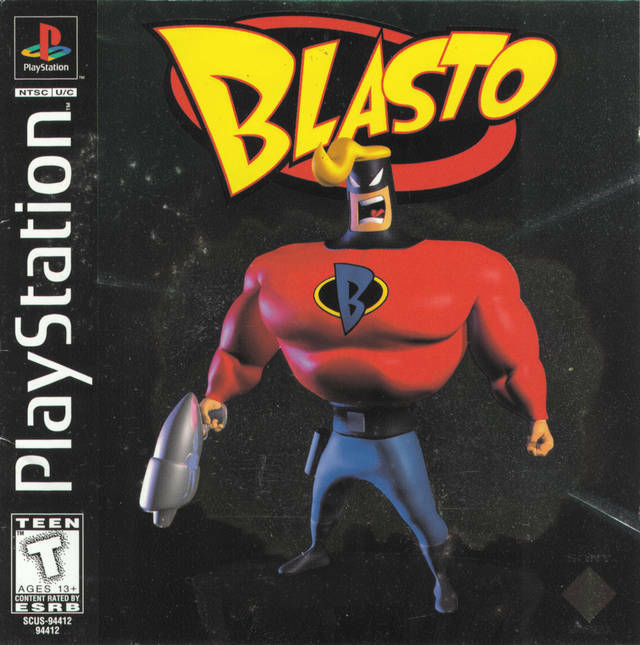 During the PS1 era I would have named Blasto in my favorite games list—next to Tomba and Crash Bandicoot. Nostalgia can be seen as hallucination of the past. But the sentiments around the memories of Blasto are real today. The game and the real life context left unforgettable impressions. Blasto and the fun I had wasn’t forgotten. I remember that day at the EB. I remember my stepdad happy to see his son with no developed taste find joy in bad entertainment that he never understood, but never stigmatized. As I was trying to close this post out, my younger brother noticed the featured image. He said he remembered that game. He played it in 2010, when he was 11. He agreed it was difficult, but he said it was a good game with great conviction. He too never got very far. It seems that without the years of baggage, cynicism, and influence of adulthood Blasto was a great game. Games from our childhood seem to evoke a particularly strong nostalgia. I suppose games in a way are a lived fantasy, the repetitive role play easily memorized. And years laters, like the memories of loved ones who passed away, the strongest feelings are those associated with joy: You, sci-fi Johnny Bravo, killin’ aliens and saving space babes.